I am writing this directly on Sapphire Beach St Thomas. Well, it's more jotting down my impressions in my battered, trustworthy moleskin notebook. When I am back on deck tonight, I'll turn it into a proper article. Today we are docked in St Thomas at CrownBay Center Pier, which is new, to us anyway. It is about 10 minutes by taxi to downtown depending on the traffic. There are not many stores at this pier compared to the Heavensight pier. 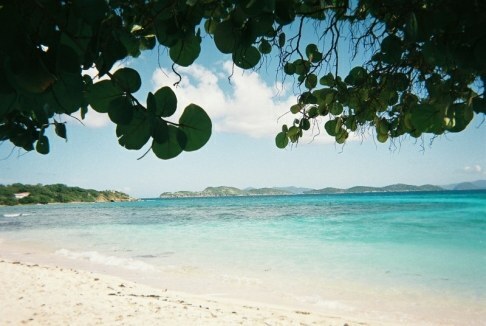 We were going snorkeling to our favorite spot in St-Thomas, Sapphire Beach which is on the other side of the island. It costs $11.00 per person one way to get there and takes about 30 minutes. It's a very nice beach, quiet and relaxed. The best snorkeling there is on the left side of the beach, almost at the end, in front of the condos. You can rent snorkeling sets, $5 for 1 hr, $8 for 2 hrs and $10 all day. Chair rental is $7 with no time limit. Soft drinks and beer are sold on the beach. There used to be a restaurant but I think they closed it. As we were leaving, a local told us that the dark water in the middle of the beach (a bit on the left of the equipment rental shack) is seagrass and there are about 5 turtles and a couple of stingrays living there. At Sapphire Beach St Thomas, you're almost sure to see at least a turtle. There are always taxis at this hotel so we got one right away and were back on ship around 1:30 just in time for late lunch! (can't miss that!). Tomorrow is our last day at sea and then we will be anchored at Princess Cays in the Bahamas. Princess Cays is a special treat that the Princess Cruise lines have for their passengers... a resort exclusive to their guests. And then it's over until our next cruise!